Liaison Continent Insurance provides comprehensive medical coverage for individuals and families traveling outside their home country. This temporary insurance plan pays 80% of the first $5,000 and 100% thereafter for covered expenses after the deductible is satisfied and offers travel medical protection including out-patient treatment, in-patient treatment, emergency services, emergency medical evacuation, and more. Liaison Continent Insurance covers trips between 5 days to 6 months and allows visitors covered under this policy to visit any doctor or hospital within the PPO Network. 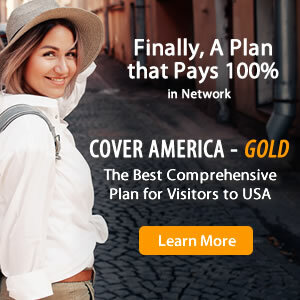 Liaison Continent Insurance is best suited for international tourists visiting the US. How to Buy Liaison Continent Insurance? Thanks so much for sharing your feedback Shivdev! We're happy that your experience was a good one. IT was a smooth purchase and nice email notifications. We really appreciate you taking the time to leave a review! We value your feedback and we're so glad to hear you had a positive experience. Please let us know if we can be of further assistance and we'll be happy to help.